Distribution. Rose chafer occurs principally in eastern North America, from Maine, Quebec, and Ontario south to Virginia, Georgia, and Tennessee. However, to a lesser degree its range also extends west to Nebraska and Oklahoma, and is replaced in the southwestern states by western rose chafer. These species are native to North America. Host Plants. Known mostly as a pest of rose, peony and grapes, rose chafer adults feed on a wide variety of plants, including such vegetables as asparagus, bean, beet, cabbage, corn, pepper, rhubarb, sweet potato, tomato, and perhaps others. 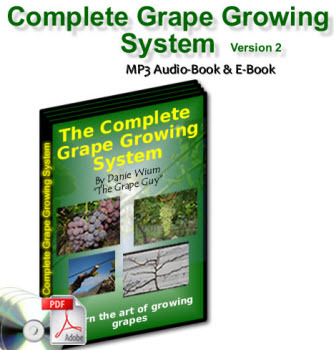 Apple, blackberry, cherry, grape, peach, pear, plum and strawberry are among the fruits damaged. Flowers injured include dahlia, daisy, foxglove, geranium, hollyhock, iris, hydrangea, peony, poppy, and rose, though foxglove apparently is poisonous to beetles. Trees such as elm, magnolia, oak, sassafras, sumac and others also are attacked; even conifers are not immune to attack. Larvae attack the roots of grasses and other plants. The dietary of western rose chafer is poorly documented, but apparently is similar to rose chafer. Natural Enemies. The natural enemies are not well documented. General predators such as birds and toads are known to feed on rose chafer beetles, and ground beetles (Coleoptera: Carabidae) are thought to consume larvae, but there appear to be no records of parasitoids. It is difficult to imagine native species without a large complement of natural enemies, so the absence of records must simply reflect lack of attention by entomologists in recent times. June, eggs are deposited in June-July, and larvae develop from July until cold weather drives them deep into the soil, usually in October-November. The eggs reportedly are deposited in light, sandy soil or tilled soil, but not in dense sod or heavy, wet soil, because larvae are usually found only in the former environments. However, in preference tests adults oviposited preferentially in wet soil, and were not affected by soil texture (Allsopp et al., 1992), so ovi-position behavior is not fully known. The eggs are nearly spherical or oval, yellowish white, and measure about 0.8 mm in diameter. The adult deposits eggs singly along a burrow, which she digs below-ground, sometimes to a depth of 10 cm, but also very near the soil surface. Fecundity is reported to be 24-36 eggs, all of which are deposited in a single burrow. Duration of the egg stage is about 21 days. Upon hatching, larvae may feed on organic matter in the soil but generally feed on roots. Larvae are yellowish white, with a tinge of blue toward the tip of the abdomen, well equipped with hairs, and attain a length of about 20 mm by autumn. The head is pale red. The body is C-shaped like most scarab beetles, though they are not as heavy-bodied as most white grubs. Larvae descend below the frost line in the winter, returning to the surface in the spring to feed for 2-4 weeks before pupating. 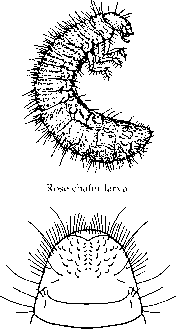 Terminal abdominal segment (ventral view) of rose chafer larva. Pupation occurs in a small cell prepared by the larva near the soil surface. The pupa is yellowish white, about 15 mm long, and generally resembles the adult, though the wings are undeveloped and the legs are drawn up close to the underside of the body. Duration of the pupal stage is 2-4 weeks. The biology of rose chafer was given by Riley (1890), Smith (1891), Chittenden (1916b), and Lamson (1922). mostly in areas with sandy soil, with beetles infrequent elsewhere. Damage to fruit causes the greatest degree of alarm among gardeners, though flower blossoms also may be shredded. Rose chafer is not generally known as a pest in commercial crops, though commercially produced grapes sometimes suffer. 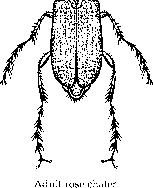 The beetles also are poisonous to chickens, with mortality due to a toxin, not to mechanical injury by the beetle's long and sharp claws as was thought previously (Lam-son, 1922). Beetle larvae feed on the eggs of Melanoplus spp. grasshoppers, but the importance of this beneficial behavior is unknown. Several chemicals have proven to be attractive to adults, and have potential for development as lures. Among the attractive chemicals are caproic acid, hex-anoic acid, valeric acid, octyl butyrate, nonyl butyrate, and others. The lures are most effective when combined with a white trap (Williams and Miller, 1982; Williams et al., 1990). Clean cultivation of crops is recommended both because tillage can destroy stages in the soil, particularly pupae, and because tillage deprives larvae of grasses and other preferred food. Insecticides applied to the foliage are usually recommended when adults are abundant.